There is no better option to keep your guest information organised and tidy than with our custom Hotel compendiums. Our custom in room compendiums are the best way to ensure your guest get the right information when they need it. You can add PVC pockets or paper directly into the mechanism (ring metal). We install one of our durable ring mechanisms (three holes as a standard) – If you would like two or four holes you can easily choose – Please select on the form. We make our Custom room compendium or room guest information folders to fit any number of pages or pockets – they can be easily changed by opening the clip. 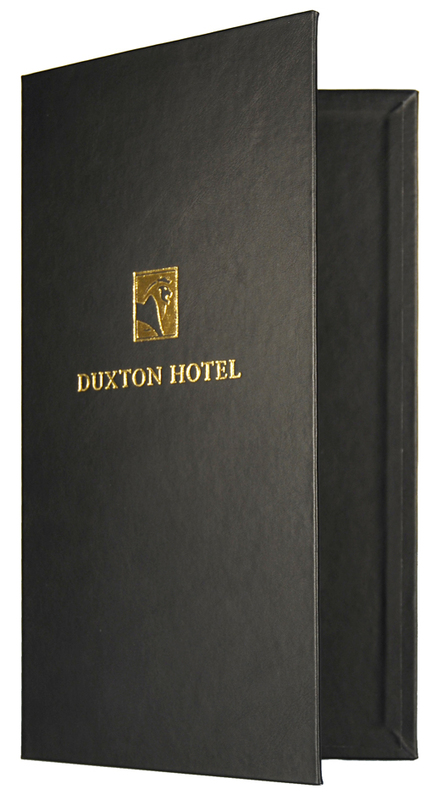 Our compendiums can be made from any of our premium fabrics they are all prefect for hotels, motels of all sizes to hold the wide range of guest information, dining information and local information that is required. Our durable custom compendiums are proven to last and are worth the investment, we add a pocket onto the inside front cover to hold addition information or leaflets. SKU: HCA4PB. Categories: Custom Compendiums, Menu covers and Compendiums.